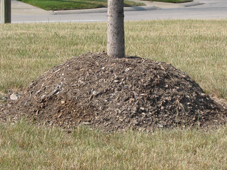 Sometime between my summer internship over thirty years ago, (working for a local landscape contractor installing high end gardens, including planting hundreds of trees in a season), and where I sit today as a landscape architect, our landscapes have been taken over by literally thousands if not millions of mulch “volcanoes”. 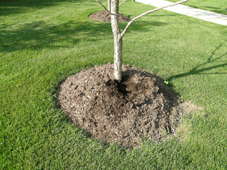 It seems to have been a slow evolution – starting as a defensive mulch ring for protection from weed whips, to planting new trees half out of the ground in poor soils, to the latest craze in sales of ground up wood palettes that have been dyed for use as mulch. 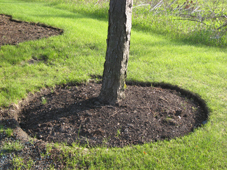 These volcanoes are killing the trees our clients have paid good money for, and that we have included in our designs to grow and mature to create timeless spaces. 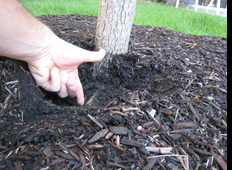 The heavy build-up of mulch against the trunk of a tree (bark is the “dry skin” of a tree, in contrast to the “wet skin” of it’s roots), creates a dampness on the bark that is similar to your hands after washing dishes or a kid staying in the pool too long or an old band-aid on your finger. The bark stays damp, decreasing it’s protective qualities and literally starts to rot. This is a nurturing ground for all kinds of insects and diseases, allowing them directly into the plant to attack the thin layer of living cambium below the bark and all parts beyond. 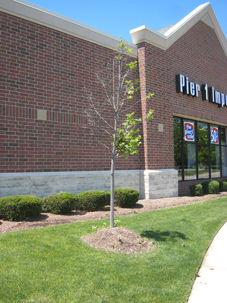 Or, if enough rot occurs, the tree is girdled and suffers a slow death. So what to do? 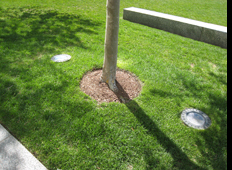 In our office we give clients a picture book/ handbook we wrote explaining easy and basic maintenance for the landscape once it has been through the installation warranty period. We include lots of photos of “Best Practices” and “Not Best Practices”- pictures say it all and save alot of lengthy explaining. A good client of ours saw the cost savings from one of their 20 acre properties and had us create a more extensive handbook and do short amateur video for use by all of their grounds maintenance personnel on all of their properties. 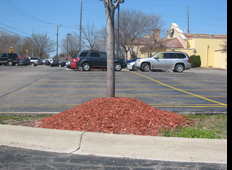 The money saved on truckloads of excess mulch is better used for seasonal color or holiday lighting that increases positive client image in the community and more customer traffic to their retail properties. Ken- Nice job. You made some excellent points that I hope carry over to saving the health of many trees and a few dollars for your clients along the way. Young and wise 30 years ago, it is a delight to see you still in ‘top form’, Ken. After all these years, my garden has loving hints of you … the bones remain. 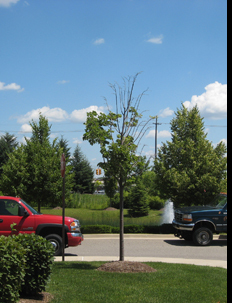 “Volcanoes”…so much mulch…tree decline and death…so much WASTE! Thank you Ken for speaking out! Great forum…hope the offenders read this!